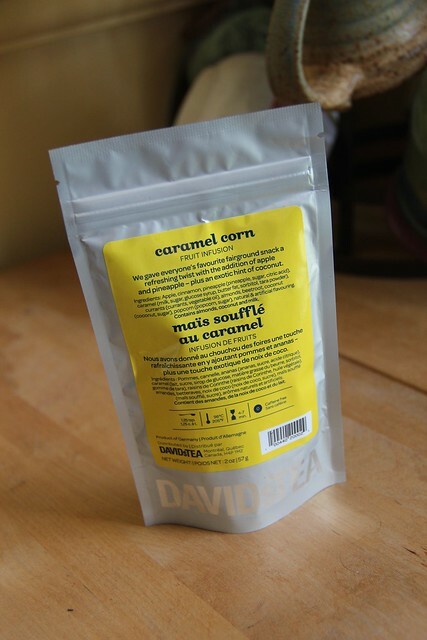 Another new fall offering from David’s Tea that I couldn’t resist trying is Caramel Corn. From the package, Caramel Corn contains apple, cinnamon, pineapple, caramel, currants, almonds, beetroot, coconut and popcorn. While I just ordered this one, it doesn’t appear to be available on the site right now. Perhaps it was popular? When I first opened the bag I could smell the caramel, and see the big chunks of cinnamon and popcorn. Once brewed I totally got the toasted corn smell from the tea. 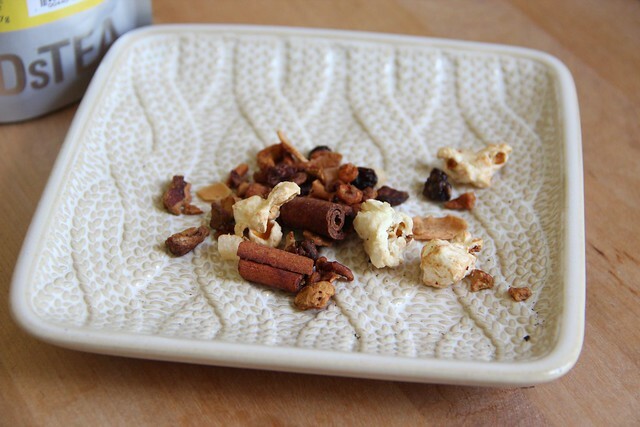 The tea itself was very very mild – a hint of fruit and a bit of cinnamon, but every time I pulled the cup up to take a drink I got the fresh popcorn smell. It was a bit of an odd experience but overall I enjoyed the tea.